While Nintendo Switch is often praised for its unique take on handheld gaming and how it drives local multiplayer gaming, less is said about its overall accessibility. With the introduction of Labo, Pokemon Let’s Go and now New Super Mario Bros U Deluxe, Nintendo show they’re not just trying to cater to the same core fanbase they’ve had over the years, they’re making it easier than ever for more people to engage with their landmark products. Pokemon Let’s Go reimagined the original Yellow game with new catch mechanics and connectivity with Pokemon GO, while Labo lets families play together to create new and exciting things which can then be brought to life in the game. New Super Mario Bros U Deluxe has gone several steps further. You can play as Mario, Luigi, and Toad as normal, of course, but Nintendo have also added in the option of Toadette and Nabbit to make things a bit easier. With Nabbit you can run through all the courses without taking any damage from enemies, however if you fall down a pit you will lose a life. He also doesn’t transform if you collect any powerups through the level, meaning you don’t even have to worry about their differing properties. 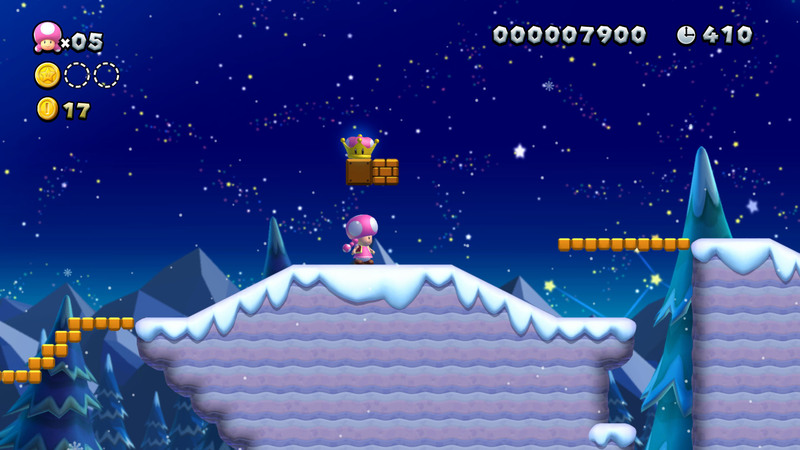 With Toadette, she can actually earn 3-Up Moons instead of 1-Up Green Toadstools, so you’ll soon have an overabundance of lives without really trying. On top of that, she can transform into Princess Peach who can float and double jump if and you somehow fall down a shaft, she’ll float right back up again. By playing as either Toadette or Nabbit, 100 extra seconds are added to the course time so you’re not racing against the clock as you go. You don’t even have to fight against the current when swimming underwater, Nintendo have enabled you to move as freely as you’d like. Some levels in New Super Mario Bros U Deluxe can be a bit tricky, so it’s nice that you can play them through on your own with all the extra added perks, but if you’re still struggling, you can also team up with a friend to get you through. If there’s more than one of you playing, you can choose to enter a bubble-like state and float through the level without taking damage. And if you can’t manage to work your way through, a green Super Guide Block will eventually appear with Luigi offering a demonstration on how to beat the course. You can even watch a series of videos from the main screen which show you how to collect and unlock everything in each course through Super Plays. As with every Mario game, there’s a wealth of powerups that will also see you right, with stars to make you invincible, a PP suit that enables you to fly, the fire and ice plants which give you the power to shoot you shoot, amongst other accessories. 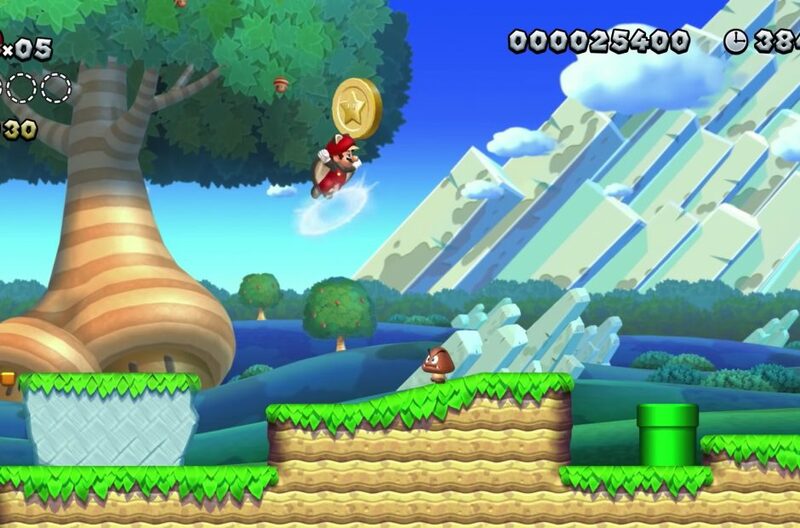 And with all the coins scattered around and points to collect, in addition to the mushroom huts scattered through the level, you’ll be earning lives and bonuses like they’re going out of fashion. Nintendo have even thought about making the control scheme accessible as if you shake the JoyCon, you can do a spin jump! New Super Mario Bros U Deluxe is friendly to those who may have never touched a Nintendo console or haven’t played since they were kids. They can come back in and get used to playing games again. And it’s wonderful. 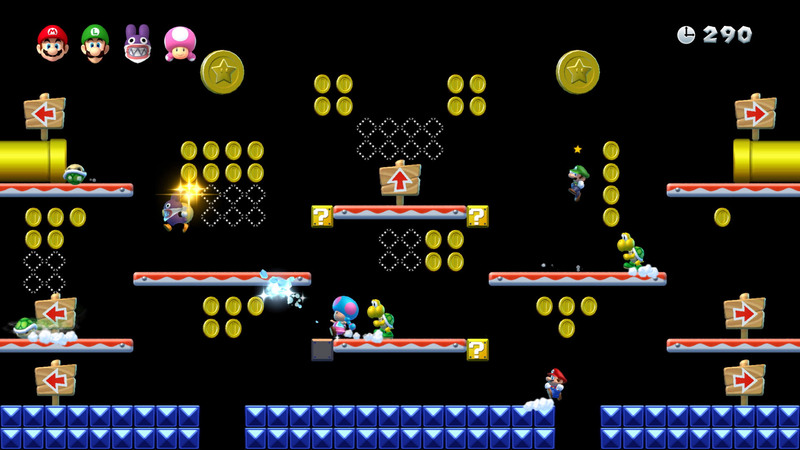 In an age where Xbox and PS4 games often intimidate people with the amount of buttons you need to remember, New Super Mario Bros U Deluxe can be as basic or as complex as you’d like it to be. With the likes of Animal Crossing, Metroid Prime 4, Fire Emblem and more on the horizon, one wonders how Nintendo will continue to accommodate less experienced gamers with their control schemes and mechanics. What is clear is that they are leading the way over their rivals, opening up gaming to more people than ever before and New Super Mario Bros U Deluxe is the most comfortable, least blood-boiling gaming experience I’ve had in quite some time.